As of June 30, 2016, the last business day of the registrant’s most recent completed second quarter, the aggregate market value of the common stock held by non-affiliates of the registrant was approximately $350,814,000 based on the closing sale price for the registrant’s common stock on the NASDAQ Global Market on that date of $8.70 per share. This number is provided only for the purpose of this report on Form 10-K and does not represent an admission by either the registrant or any such person as to the status of such person. The number of outstanding shares of the registrant’s common stock on February 24, 2017 was 47,051,202. The common stock is listed on the NASDAQ Global Market (trading symbol “GNMK”). Portions of the registrant’s definitive Proxy Statement to be filed with the Securities and Exchange Commission within 120 days after the close of the fiscal year are incorporated by reference into Part III of this report. This Annual Report on Form 10-K, or Annual Report, particularly in Item 1. “Business” and Item 7. “Management’s Discussion and Analysis of Financial Condition and Results of Operations,” and the documents incorporated herein by reference, include forward-looking statements within the meaning of Section 27A of the Securities Act of 1933, as amended, or the Securities Act, and Section 21E of the Securities Exchange Act of 1934, as amended, or the Exchange Act. All statements, other than statements of historical fact are statements that could be deemed to be forward-looking statements, including, but not limited to, statements regarding our future financial position, business strategy, research and development efforts, and plans and objectives of management for future operations. When used in this Annual Report, the words “believe,” “may,” “could,” “will,” “estimate,” “continue,” “intend,” “expect,” “target,” “anticipate,” “aim,” “plan” and similar expressions, including their use in the negative, are intended to identify forward-looking statements. These forward-looking statements are based on current expectations, estimates, forecasts and projections about our business and the industry in which we operate and management’s beliefs and assumptions. They are not guarantees of future performance or development and involve known and unknown risks, uncertainties and other factors that are in some cases beyond our control. As a result, any or all of our forward-looking statements in this Annual Report may turn out to be inaccurate. Risks and other factors that may cause such differences include, but are not limited to, those described under the heading “Risk Factors” in Item 1A of Part I of this Annual Report. In light of these risks, uncertainties and assumptions, actual results and timing of events could differ materially and adversely from those anticipated or implied in the forward-looking statements. Accordingly, readers are cautioned not to place undue reliance on such forward-looking statements. Except as required by law, we do not intend to update these forward-looking statements publicly or to update the reasons actual results could differ materially from those anticipated in these forward-looking statements, even if new information becomes available in the future. GenMark®, eSensor®, XT-8® and ePlex® and our other logos and trademarks are the property of GenMark Diagnostics, Inc. or its subsidiaries. All other brand names or trademarks appearing in this Annual Report are the property of their respective holders. Our use or display of other parties’ trademarks, trade dress or products in this Annual Report does not imply that we have a relationship with, or the endorsement or sponsorship of, the trademark or trade dress owners. This Annual Report includes market share and industry data and forecasts that we obtained from industry publications and surveys. Industry publications, surveys and forecasts generally state that the information contained therein has been obtained from sources believed to be reliable, but there can be no assurance as to the accuracy or completeness of such included information. We have not independently verified any of the data from third-party sources nor have we ascertained the underlying economic assumptions relied upon therein. While we are not aware of any misstatements regarding the industry and market data presented herein, the data involve risks and uncertainties and are subject to change based on various factors. GenMark Diagnostics, Inc., or GenMark, is a molecular diagnostics company focused on developing and commercializing multiplex molecular tests that aid in the diagnosis of complex medical conditions and help guide therapy decisions. References herein to “we,” “us” or “our” refer to GenMark Diagnostics, Inc. and its wholly owned subsidiaries, unless the context specifically requires otherwise. We currently develop and commercialize high-value, simple to perform, clinically relevant multiplex molecular tests based on our proprietary eSensor electrochemical detection technology. We currently sell our XT-8 instrument and related diagnostic and research tests, as well as certain custom manufactured reagents, which collectively we refer to as our XT-8 system. Our XT-8 system supports a broad range of molecular tests with a compact and easy-to-use workstation and disposable test cartridges. In addition, we have developed and are commercializing of our sample-to-answer ePlex instrument and Respiratory Pathogen (RP) Panel. We intend to offer a number of additional associated diagnostic tests for use with our ePlex instrument, which we collectively refer to as our ePlex system. Since inception, we have incurred net losses from operations each year, and we expect to continue to incur losses for the foreseeable future. Our net losses for the fiscal year ended December 31, 2016 and 2015 were approximately $50.6 million and $42.2 million, respectively. As of December 31, 2016, we had an accumulated deficit of $355.3 million. Our operations to date have been funded principally through sales of capital stock, borrowings, and cash from operations. We expect to incur increasing expenses over the next several years, principally to commercialize our ePlex system, as well as to further increase our manufacturing capabilities and domestic and international commercial organization. Successfully Commercialize our ePlex System. We believe the ePlex system is an attractive solution for a broad range of hospitals and laboratories that lack the technical or economic resources to perform molecular diagnostic testing with existing products and technology. We believe the ePlex system will expand our current potential user base from approximately 1,000 domestic customers to approximately 12,000 potential customers globally. Expand our Menu of Clinical Diagnostic Products. We intend to develop a broad menu of molecular diagnostic tests for our ePlex system that we believe will satisfy important medical needs and present attractive commercial opportunities. For example, in June 2016 we obtained CE Mark of our ePlex instrument and RP Panel, and in December 2016 we submitted 510(k) applications to the United States Food and Drug Administration, or the FDA, for our ePlex instrument and RP Panel. During 2017, we intend to complete the development of, CE Mark, and submit 510(k) applications to the FDA our ePlex blood culture identification (BCID) family of panels, which include a gram-positive (GP), a gram-negative (GN), and a fungal pathogen panel. In addition, we are actively evaluating the development of additional assay panels that we believe will meet important, unmet clinical needs, which our ePlex system is uniquely positioned to address. Grow our Installed Base of Customers. We have identified those laboratories and hospitals that we believe will benefit from our product portfolio. We intend to leverage our commercial organization to drive placements of our ePlex system both domestically and internationally. We anticipate that the expansion of our installed base of customers will drive sales of our test cartridges, from which we anticipate generating the majority of our revenues for the foreseeable future. Increase Test Utilization. We intend to increase the use of our diagnostic tests by developing and offering tools and support tailored to our products such as education programs and seminars, product training for our customers, and reimbursement support. These activities are designed to aid in establishing the clinical and health economic utility of multiplex molecular diagnostic tests, which we believe will increase adoption of our products. Revenues, net loss, and total assets for the past three years are contained in our consolidated financial statements in Part II of this Annual Report. Substantially all of our revenues for the periods reported in our consolidated financial statements in Part II of this Annual Report were derived from customers located within the United States. Our proprietary eSensor technology is based on the principles of deoxyribonucleic acid, or DNA, hybridization and electrochemical detection. DNA naturally forms a double-stranded structure, with each strand binding with high affinity, or hybridizing, only to a complementary strand. Our technology takes advantage of this highly specific binding by first creating two types of single-stranded DNA, the capture probe and the signal probe. The capture probe and signal probe are each complementary to a different segment of the target DNA that is the focus of the particular diagnostic test. Using our technology and processes, we attach our capture probes to a proprietary monolayer on the surface of a gold electrode within our test cartridges. We separately attach ferrocene, a proprietary label, to our signal probes. Before placing the sample into our XT-8 test cartridge, the technician mixes the amplified DNA sample with our signal probe. If the target biomarker is present in the prepared patient sample, a segment of the biomarker DNA will hybridize with a solution containing our signal probe. This solution is then run past an electrode, against which our capture probes have been immobilized. The as-yet unbound segment of the target biomarker binds to our capture probe, creating a target DNA, signal probe, capture probe complex at the surface of the electrode. This complex produces an electrochemical signal which is analyzed and interpreted by our XT-8 system. With our ePlex sample-to-answer test cartridges, the operator adds a patient sample directly or with minimal preparation into the sample chamber, closes the lid, and inserts the test cartridge into the ePlex instrument. Within the instrument, the same steps performed by a technician with the XT-8 system are performed within the ePlex test cartridge, resulting in the delivery of target DNA and signal probes to the eSensor electrodes within the ePlex cartridge. As with XT-8, when a complex forms as a result of a target match, the complex produces an electrochemical signal that is interpreted by the ePlex system. Our XT-8 and ePlex test cartridges utilize the combination of distinct electrodes and multiple signal probes to detect dozens of target biomarkers from a single sample, thereby enabling highly multiplexed testing. Our eSensor technology is highly specific for the target biomarker, and is not based on optical or fluorescent detection. As a result, our diagnostic tests are less prone to sample contamination risk and do not require many of the time-consuming washing and preparation steps required by competing technologies. The sample preparation steps required before using our XT-8 test cartridges are nucleic acid purification and a polymerase chain reaction, or PCR, amplification, which involves amplifying, or generating billions of copies of the target DNA molecules, followed by transfer of the sample to our test cartridge and insertion of the test cartridge into any open module in our XT-8 system. In some XT-8 tests, amplified DNA is subject to an additional enzymatic treatment to produce a single-stranded-DNA. In contrast, the ePlex system generally requires no pre-analytic steps to be performed by the user, except, in limited cases, certain minimal up-front sample handling. We believe our proprietary electrochemical detection technology has several advantages over other signal detection platforms, including high sensitivity and accuracy, streamlined sample preparation, efficient multiplexing, effective use of lab space, low maintenance, and the ability to cost-effectively develop additional tests. Digital microfluidics is another innovative technology included within our ePlex system which we have exclusively licensed within a defined field of use from an affiliate of Illumina, Inc. Digital microfluidics is a technique for moving small droplets of liquid using electrowetting, a process for making a surface hydrophobic or hydrophilic based on the application of a voltage to a surface. Our ePlex printed circuit board contains eSensor electrodes capable of nucleic acid detection along with electrowetting electrodes capable of digital microfluidics. The ePlex system uses numerous choreographed digital inputs to perform the fluid manipulations associated with sample-to-answer molecular diagnostics. Drops are dispensed, mixed, merged, heated, cooled, split and delivered, all under precise and programmable digital control. In this manner, standard procedures of the molecular diagnostics lab (e.g., DNA purification, PCR, exonuclease digestion, etc.) can be performed automatically within our ePlex cartridge. Our XT-8 System. Our XT-8 instrument is a post-PCR multiplex workstation that has a modular design consisting of an integrated touch screen and up to three analyzers. Each analyzer contains eight modules into which individual test cartridges are placed. The test cartridge modules operate independently of each other allowing up to 24 independent test cartridges to be loaded at one time, with the remaining modules available for use at any future time while the system is running. We offer the following four FDA-cleared assays on our XT-8 instrument: a Respiratory Viral Panel, Cystic Fibrosis Genotyping Test, Thrombofilia Risk Test, and a Warfarin Sensitivity Test. We also offer a Hepatitis C (HCV) Genotyping Test and associated custom manufactured reagents, as well as a 2C19 Genotyping Test, each of which is available for research use only (RUO). Approximately 30 minutes post-PCR to result from an amplified DNA sample with minimal technician time needed. Our Cystic Fibrosis Genotyping Test, our Warfarin Sensitivity Test and our Thrombophilia Risk Test demonstrated 100% accuracy in clinical studies compared to DNA sequencing and other standards. Minimal manual processing steps, intuitive touch-screen interface and clear result reports. Each of up to 24 test cartridge modules can be accessed independently resulting in a highly flexible workflow. No routine maintenance or calibration is required. Detects numerous distinct biomarkers in a single sample reducing the need for reflex testing. Our ePlex System. Our ePlex instrument is a multiplex, sample-to-answer platform that fully integrates nucleic acid extraction, amplification and detection and has a modular design consisting of an integrated touch screen and up to four analyzers. Each analyzer contains six modules into which individual ePlex panel test cartridges are placed. The test cartridge modules operate independently supporting continuous random access of up to 24 independent test cartridges. We obtained CE Mark for our ePlex system and RP Panel in June 2016, and filed 510(k) applications with the FDA for the ePlex instrument and RP Panel in December 2016. During 2017, we intend to complete the development of, CE Mark, and submit 510(k) applications to the FDA our ePlex blood culture identification (BCID) family of panels, which include a gram-positive (GP), a gram-negative (GN), and a fungal pathogen panel. In addition, we are actively evaluating the development of additional assay panels that we believe will meet important, unmet clinical needs, which our ePlex system is uniquely positioned to address. The user simply adds a raw or minimally prepared sample to the test cartridge and inserts the cartridge into the instrument. Results are capable of being produced in approximately 1-2 hours from sample input. Minimal maintenance or calibration is required. Incorporates patented positive patient identification technology to reduce sample reporting errors. Multiple design features to improve operational efficiency, such as bi-directional laboratory information system (LIS) connectivity and remote access capability to reduce downtime and service costs. We believe the aggregate global total addressable market for the tests we currently offer, are actively developing on ePlex, or may consider developing is approximately $2.5 billion. Many factors are driving the strong opportunity in this market, including increased demand for infectious disease diagnostic solutions and an increased focus on value-based medical care that enhances patient outcomes, improves key quality metrics, and reduces the total cost-of-care. On Market Product Support. A role of our R&D team is to assist our manufacturing and quality assurance teams in ensuring high product quality and thorough complaint handling and investigation. This team also supports improvements in quality control methods and metrics and are active participants in the continuous improvement processes utilized by our product manufacturing teams. Improving the Clinical and Practical Utility of our Tests. Our R&D organization also supports the clinical utility and value of our molecular diagnostic tests. We have previously and intend to continue to partner with academic and reference laboratories to perform validation and clinical studies on our tests. Key aspects of our efforts are aimed at improving workflow in the laboratory setting, positively comparing our tests to historical or “gold standard” tests, and demonstrating that our tests can help improve patient care and lower diagnostic and medical treatment costs. We intend to publish the results from these clinical studies in peer-reviewed or trade journals, submit them to regulatory bodies and present them at industry conferences in support of our commercialization strategy. We manufacture our proprietary test cartridges, certain related components and ancillary reagents in our Carlsbad, California facilities. We perform reagent formulation, test cartridge manufacturing and packaging of final components and test cartridges in accordance with applicable guidelines for medical device manufacturing. We currently lease an aggregate of approximately 87,000 square feet at two nearby locations in Carlsbad, California, where we maintain our corporate office and manufacturing facilities. We currently outsource the manufacture of our XT-8 instrument to Leica Biosystems Melbourne Pty Ltd., or Leica, and outsource the manufacture of our ePlex instrument to Plexus Corp, or Plexus. We rely on third party suppliers, including in certain instances, sole source suppliers, for certain raw materials and other supplies and components used in our products. We have implemented a quality management system designed to comply with FDA regulations and ISO standards governing diagnostic medical device products. These regulations control the design, manufacture, testing and release of diagnostics products, as well as raw material receipt and control. In 2012, our Carlsbad, California corporate headquarters facility obtained ISO 13485 certification. We control methods for the consistent manufacturing of our proprietary test cartridges and reagents at our facilities. Our key outsourcing partners are regularly audited to help ensure a continual supply of high quality components. We plan to continue to manufacture components that we determine are highly proprietary or highly customized, while outsourcing more commodity-like components. We are likely to establish additional outsourcing partnerships as we manufacture additional products. Our current sales and marketing strategy is to expand our business globally with the commercialization of our ePlex system in the United States and Europe, while also continuing to support the placement and use of our XT-8 system in the United States. Our products are sold in the United States through a geographically dispersed direct sales and technically specialized service organization, which is supported by a centralized team of product managers and marketing, customer support, and technical support personnel. We utilize a direct sales and technical support team to sell our ePlex system in certain key European countries, which are augmented by distributors in other locations internationally. Our sales representatives typically have experience in molecular diagnostics and a network of laboratory contacts within their respective territories. We utilize our representatives’ knowledge along with market research databases to target and qualify our customers. We execute a variety of sales campaigns and strategies to meet the buying criteria of the different customer segments we serve. To support the growth in our customer base and our launch plans for our ePlex system, we continue to make investments in these customer facing organizations. Capital Purchase: The instrument is paid for upfront and in its entirety by the customer. Customers are also eligible to receive structured pricing incentives if they enter into an optional annual minimum cartridge purchase commitment. Reagent Rental: A reagent rental agreement requires that a customer commit to purchase a minimum number of test cartridges over the term of the agreement, and a portion of the charge for each cartridge is attributable to a usage fee for the instrument. Our target customers include hospital-based laboratories and research institutions. We believe our ePlex system will expand our current potential user base from approximately 1,000 domestic customers to approximately 12,000 potential customers globally. In 2016 and 2015, Laboratory Corporation of America, Inc. represented 27% and 17%, respectively, of our total revenue. In 2014, no single customer represented more than 10% of our total revenue. We primarily face competition in the molecular diagnostic testing markets with testing products and systems developed by public and private companies such as bioMerieux (which acquired Biofire Diagnostics, Inc.), Luminex Corporation (which acquired Nanosphere, Inc.), Danaher Corporation (which acquired Cephied), Siemens, Hologic, Inc., Seegene, Roche Diagnostics and Abbott Molecular Diagnostics. Our diagnostic tests also face competition with laboratory developed tests, or LDTs, developed by national and regional reference laboratories and hospitals. We believe that our testing systems compete largely on the basis of accuracy, reliability, enhanced laboratory workflow, multiplex capability, ease-of-use and return on investment for customers. Many of our competitors have substantially greater financial, technical, research and other resources and larger, more established marketing, sales and distribution organizations than we do. Many of our competitors also offer broader product lines and have greater brand recognition than we do. Moreover, our existing and new competitors may make rapid technological developments that may result in our technologies and products becoming obsolete before we recover the expenses incurred to develop them or before they generate significant revenue. To establish and protect our proprietary technologies and products, we rely on a combination of our patents, copyrights, trademarks, and trade secrets, as well as other intellectual property rights in our technology and business information. Our intellectual property portfolio for our core electrochemical technology was initially built through the combination of our acquisition of the Clinical Micro Sensors business from Motorola and licensing patents from the California Institute of Technology. We also have exclusively licensed the digital microfluidics technology utilized in our ePlex system within a defined field of use from an affiliate of Illumina. We believe that our patent portfolio, which includes over 100 owned and exclusively licensed U.S. and foreign patents and approximately 30 pending applications, provides us with extensive protection of our eSensor systems. We continue to pursue the issuance of new patents to protect our ongoing research, development and commercial activities, in particular with respect to our ePlex system and related consumables. In general, patents have a term of at least 20 years from the application filing date or earlier claimed priority date. A majority of our issued and exclusively licensed patents are scheduled to expire by 2021, with approximately one half of the patents expiring by 2018. Several of our pending applications have the potential to mature into patents that may expire between 2028 and 2034. Our success depends to a significant degree upon our ability to police infringement and continue to develop proprietary products and technologies without infringing the intellectual property rights of others. We also rely in part on trade secret protection of our intellectual property. We attempt to protect our trade secrets by entering into confidentiality agreements with third parties, employees and consultants. Our employees and consultants also sign agreements requiring that they assign to us their interests in intellectual property, such as patents and copyrights arising from their work for us. All employees sign an agreement not to compete unfairly with us during their employment and upon termination of their employment through the misuse of confidential information. We also have filed for registration, or obtained registration, in the U.S. and other countries for marks used with our products and technology. Our issued trademarks in the United States and/or Europe include eSensor®, word and design marks for GenMark®, GenMark DX®, eSensor®, XT-8®, eSensor XT-8®, ePlex®, and GenMark ePlex®, among others. The design, development, manufacture, testing and sale of our molecular diagnostic products are subject to regulation by numerous governmental authorities, principally the FDA, and corresponding state and foreign regulatory agencies. In the United States, the Federal Food, Drug, and Cosmetic Act, or FDCA, FDA regulations and other federal and state statutes and regulations govern, among other things, medical device design and development, preclinical and clinical testing, premarket clearance or approval, registration and listing, manufacturing, labeling, storage, advertising and promotion, sales and distribution, export and import, and post-market surveillance. The FDA regulates the design, manufacturing, servicing, sale and distribution of medical devices, including molecular diagnostic test kits and instrumentation systems. Failure to comply with applicable U.S. requirements may subject a company to a variety of administrative or judicial sanctions, such as FDA refusal to approve pending applications, warning letters, product recalls, product seizures, total or partial suspension of production or distribution, injunctions, fines, civil penalties and criminal prosecution. Unless an exemption applies, each medical device we wish to distribute commercially in the United States will require marketing authorization from the FDA prior to distribution. The two primary types of FDA marketing authorization required applicable to a device are premarket notification, also called 510(k) clearance, and premarket approval, also called PMA. We have obtained 510(k) clearance from the FDA for the following molecular diagnostic tests for use on our XT-8 system: the Respiratory Viral panel, the eSensor Warfarin Sensitivity Test, the Cystic Fibrosis Genotyping Test, and the Thrombophilia Risk Test. In December 2016, we filed 510(k) applications with the FDA for our ePlex instrument and RP Panel. Proposed Regulation of Laboratory Developed Tests (LDTs). In October 2014, the FDA promulgated draft guidance which describes a new proposed regulatory framework for LDTs. Based on this proposal, clinical laboratories that develop and use LDTs would be required to comply with specific regulatory requirements (e.g., adverse even reporting, quality system regulation, or QSR, premarket submission, and FDA review) prior to the use of LDTs for clinical diagnostic purposes. The timeline for phasing in the proposed regulatory requirements would begin upon finalization of the FDA guidance document. The ultimate impact of this draft guidance on our customers remains uncertain. Regulation after FDA Clearance or Approval. Any devices we manufacture or distribute pursuant to clearance or approval by the FDA are subject to pervasive and continuing regulation by the FDA and certain state agencies. We are required to adhere to applicable regulations setting forth detailed Good Manufacturing Practices, or GMP, requirements, as set forth in the QSR, which includes testing, control and documentation requirements. Non-compliance with these standards can result in fines, injunctions, civil penalties, recalls or seizures of products, total or partial suspension of production, refusal of the government to grant 510(k) clearance or PMA of devices, withdrawal of marketing approvals and criminal prosecutions. We have designed and implemented quality system processes within our manufacturing facilities in order to comply with FDA’s GMP requirements. Because we are a medical device manufacturer, we must also comply with FDA’s medical device reporting requirements whenever there is evidence that reasonably suggests that one of our products may have caused or contributed to a death or serious injury. We must also report any incident in which our product has malfunctioned if that malfunction would likely cause or contribute to a death or serious injury if it were to recur. Labeling, advertising, and promotional activities are subject to scrutiny by the FDA and, in certain circumstances, by the Federal Trade Commission. Medical devices approved or cleared by the FDA may not be promoted for unapproved or uncleared uses, otherwise known as “off-label” promotion. The FDA and other agencies actively enforce the laws and regulations prohibiting the promotion of off-label uses, and a company that is found to have improperly promoted off-label uses may be subject to significant liability, including substantial monetary penalties and criminal prosecution. We have implemented quality system processes and advertising/promotional policies designed to comply with these requirements. Environmental Regulations. We are also subject to numerous federal, state and local laws relating to such matters as safe working conditions, manufacturing practices, environmental protection, fire hazard control and disposal of hazardous or potentially hazardous substances. Some of these laws require us to obtain licenses or permits to conduct our operations. We have numerous policies and quality system procedures in place to ensure compliance with these laws and to minimize the risk of occupational exposure to hazardous materials. We do not expect the operations of our products to produce significant quantities of hazardous or toxic waste or radiation that would require the use of extraordinary disposal practices. Although the costs to comply with these applicable laws and regulations have not been material, we cannot predict the impact on our business of new or amended laws or regulations or any changes in the way existing and future laws and regulations are interpreted or enforced, nor can we ensure we will be able to obtain or maintain any required licenses or permits. Export of Our Products. Medical devices that are legally marketed in the U.S. may be exported anywhere in the world without prior FDA notification or approval. Devices that have not been approved or cleared in the U.S. must follow the export provisions of the FDCA. Depending on which section of the FDCA we may export under, we may need to request an export permit letter or export certificate, or we may need to submit a simple notification. Export certificates may be requested by foreign customers or foreign governments to provide proof of the products’ status as regulated by the FDA. The export certificate is prepared by the FDA and contains information about a product’s regulatory or marketing status in the United States. Clinical Laboratory Improvement Amendments of 1988. The use of our products is also affected by the Clinical Laboratory Improvement Amendments of 1988, or CLIA, and related federal and state regulations, which provide for regulation of laboratory testing. Any customers using our products for clinical use in the United States will be regulated under CLIA, which establishes quality standards for all laboratory testing to ensure the accuracy, reliability and timeliness of patient test results regardless of where the test was performed. In particular, these regulations mandate that clinical laboratories must be certified by the federal government or a federally approved accreditation agency, or must be located in a state that has been deemed exempt from CLIA requirements because the state has in effect laws that provide for requirements equal to or more stringent than CLIA requirements. Moreover, these laboratories must meet quality assurance, quality control and personnel standards, and they must undergo proficiency testing and inspections. The CLIA standards applicable to clinical laboratories are based on the complexity of the method of testing performed by the laboratory, which range from “waived” to “moderate complexity” to “high complexity.” We expect that most of our products will be categorized as “high complexity,” since most molecular diagnostic tests are currently FDA-cleared as CLIA “high complexity” devices. Foreign Government Regulation. We intend to market our products in European and other select international markets. The regulatory pre-market requirements for in vitro diagnostic, or IVD, devices vary from country to country. Some countries impose product standards, packaging requirements, labeling requirements and import restrictions on devices. Each country has its own tariff regulations, duties and tax requirements. Failure to comply with applicable foreign regulatory requirements may subject us to fines, suspension or withdrawal of regulatory approvals, product recalls, seizure of products, operating restrictions and criminal prosecution. We are subject to numerous federal and state health care anti-fraud laws, including the federal anti-kickback statute and False Claims Act, or the FCA, that are intended to reduce waste, fraud and abuse in the health care industry. These laws are broad and subject to evolving interpretations. They prohibit many arrangements and practices that are lawful in industries other than health care, including certain payments for consulting and other personal services, some discounting arrangements, the provision of gifts and business courtesies, the furnishing of free supplies and services, and waivers of payments. In addition, many states have enacted or are considering laws that limit arrangements between medical device manufacturers and physicians and other health care providers and require significant public disclosure concerning permitted arrangements. These laws are vigorously enforced against medical device manufacturers and have resulted in manufacturers paying significant fines and penalties and being subject to stringent corrective action plans and reporting obligations. We must operate our business within the requirements of these laws and, if we were accused of violating them, we could be forced to expend significant resources on investigation, remediation and monetary penalties. Our operations are affected by the federal Patient Protection and Affordable Care Act of 2010, as modified by the Health Care and Education Reconciliation Act of 2010, which we refer to as the Health Care Act. The Health Care Act imposes a 2.3% excise tax on sales of medical devices by manufacturers. In December 2015, the excise tax was suspended for 2016 and 2017. We are unable to predict whether the suspension will be continued beyond 2017. Taxable devices include any medical device defined in section 201(h) of the FDCA and intended for use by humans, with limited exclusions for devices purchased by the general public at retail for individual use. There is no exemption for small companies, and we paid the tax from January 2013 through December 2015. The Health Care Act also requires manufacturers to report to the Department of Health and Human Services detailed information about financial arrangements with physicians and teaching hospitals. These reporting provisions preempt state laws that require reporting of the same information, but not those that require reports of different or additional information. Failure to comply with these requirements subjects the manufacturer to significant civil monetary penalties. regard from other companies, research and academic institutions, government entities and other organizations. None of our employees are covered by a collective bargaining agreement. Our corporate office is located at 5964 La Place Court, Carlsbad, California. We also lease additional manufacturing space nearby to our corporate office in Carlsbad, California. We make available, free of charge, our annual reports on Form 10-K, quarterly reports on Form 10-Q, current reports on Form 8-K and any amendments to those reports, as soon as reasonably practicable after we electronically file such material with, or furnish it to, the Securities and Exchange Commission, or the SEC. We also make these documents and certain public financial information available on our website, which is www.genmarkdx.com. Our SEC reports and other financial information can be accessed through the investor relations section of our website. Some of the information found on our website is not part of this or any other report we file with or furnish to the SEC. You should consider each of the following factors as well as the other information in this Annual Report in evaluating our business and our prospects. The risks and uncertainties described below are not the only ones we face. If any of the following risks actually occur, our business and financial results could be harmed. In that case, the trading price of our common stock could decline. You should also refer to the other information set forth in this Annual Report, including our financial statements and the related notes. We may be unsuccessful in obtaining FDA clearance for our ePlex system within our expected timeframe. We are investing significantly in the commercialization of our ePlex instrument and the development of its related molecular diagnostic panels to expand our future product offerings. Our ePlex system requires 510(k) clearance or pre-market approval by the FDA prior to marketing it for clinical use in the United States. In December 2016, we filed 510(k) applications with the FDA for our ePlex instrument and RP Panel. There are a number of potential risks associated with conducting clinical trials and obtaining regulatory clearance for our ePlex system. For example, we may have difficulty maintaining the level of product reliability and clinical accuracy required to obtain FDA clearance or approval for our ePlex system. In addition, the FDA may require that we conduct additional studies that could impact the cost associated with product clearance and could potentially delay commercial launch of our ePlex system in the United States. We may be unsuccessful in obtaining FDA clearance for our ePlex system within our expected timeframe, or at all, which could adversely impact our future financial performance and cause our stock price to decline. From time to time we and our key suppliers experience, and may in the future experience, difficulties scaling manufacturing operations to the levels required to support our anticipated growth. To date, we have produced our products in limited quantities relative to the quantities necessary to achieve our desired revenue growth. Developing the necessary manufacturing and quality procedures internally and in conjunction with our key suppliers for a significant number of our newly developed, highly complex products and product components is a challenging process. From time to time we and our suppliers experience, and may in the future experience, manufacturing variability and may not be able to consistently produce sufficient quantities of high quality products and product components at the levels necessary to achieve our revenue growth expectations or to support our product development timelines. If we or our key suppliers continue to encounter difficulties in producing sufficient yields of high quality products or product components, or scaling manufacturing operations as a result of, among other things, process and manufacturing transfer complexities, quality control and quality assurance issues, and/or availability of subcomponents, equipment and raw material supplies, our reputation may be harmed and we may not achieve our anticipated financial results or product development goals within the time frame we expect, or at all. In addition, finding solutions to product quality, reliability, and variability issues is time consuming and expensive, and we may incur significant additional costs or lose revenue as a result of, among other things, delayed product introduction, product recalls, shipment holds, scrapped material, and warranty and service obligations. or product development goals. Our failure to effectively implement the necessary processes and procedures and otherwise prepare for our anticipated growth could have a material adverse effect on our future financial condition and prospects. In determining the required quantities of our products and the manufacturing schedule, we must make significant judgments and estimates based on seasonality, inventory levels, current market trends and other related factors. Because of the inherent nature of estimates and our limited experience in marketing our products, there could be significant differences between our estimates and the actual amounts of products we require. This can result in shortages if we fail to anticipate demand, or excess inventory and write-offs if we order more than we need. The manufacturing operations for our test cartridges use highly technical processes involving unique, proprietary techniques. In addition, the manufacturing equipment we use would be costly and time consuming to repair or replace. Any interruption in our operations or decrease in the production capacity of our manufacturing facility or the facilities of any of our key suppliers because of equipment failure, natural disasters such as earthquakes, tornadoes and fires, or otherwise, would limit our ability to meet customer demand for our products and would have a material adverse effect on our business, financial condition and results of operations. In the event of a disruption, we may lose customers and we may be unable to regain those customers thereafter. Our insurance may not be sufficient to cover all of our potential losses and may not continue to be available to us on acceptable terms, or at all. We may not expand sales of our ePlex system outside the United States at the levels we anticipate. unable to establish the infrastructure or recruit highly qualified personnel to support our international direct sales and support organization, if we fail to adequately plan for or integrate our direct sales activities with those of our third party logistics provider, or if we are unsuccessful in developing awareness and acceptance of our products and technology internationally, our anticipated revenue growth internationally may not materialize, our customers may not receive the level of service or product dependability they expect from us, and our future financial performance may be adversely affected. Furthermore, any distributors we establish in particular geographic regions may not commit the necessary resources to market and sell our products to meet our expectations. If distributors do not perform adequately or in compliance with applicable laws and regulations in particular geographic areas, or if we are unable to locate distributors in particular geographic areas, our ability to realize revenue growth based on sales outside the United States would be harmed. Our future success depends on the belief by our target customers and the medical community that our molecular diagnostic products are a reliable, medically-relevant, accurate and cost-effective replacement for other diagnostic testing methods. Our business success depends on our ability to convince our target customers to perform these tests internally with our products if they have historically outsourced their testing needs or have historically used non-molecular methods to perform such testing, or to replace their current molecular testing platforms with our system and its related test offerings. companies that manufacture laboratory-based tests and analyzers, including: Cepheid; Siemens; Hologic, Inc.; Qiagen NV; bioMérieux; Roche Diagnostics; and Abbott Molecular Diagnostics. Our diagnostic tests also face competition from LDTs developed by national and regional reference laboratories and hospitals. LDTs may not currently be subject to the same regulatory requirements, including those requiring clinical trials and FDA review and clearance or approval that may apply to our diagnostic products. We anticipate that we will face increased competition in the future as new companies enter the market with new technologies, our competitors improve their current products and expand their menu of diagnostic tests, and as we expand our operations internationally. Many of our current and potential competitors have greater name recognition, more substantial intellectual property portfolios, longer operating histories, significantly greater resources to invest in new technologies, more substantial experience in new product development, greater regulatory expertise, and more extensive manufacturing and distribution capabilities. It is critical to our success that we anticipate changes in technology and customer requirements and successfully introduce enhanced and competitive technology to meet our customers’ and prospective customers’ needs on a timely basis. Revenue from our infectious disease products fluctuates based upon the occurrence of related outbreaks and changes in testing recommendations and available therapies. Influenza and other respiratory-related outbreaks are usually more concentrated in the first and fourth quarters of the year. New information or the introduction of advanced treatment options with respect to a particular disease may also affect related diagnostic testing. Although certain infectious disease outbreaks tend to occur each year, the timing, severity and length of these incidents varies from one year to another and can vary across different patient populations. In addition, we may not accurately predict changes to infectious disease testing recommendations affecting our products. As a result of one or more of these factors, we may not be able to accurately forecast sales from our infectious disease products. Our largest customer, Laboratory Corporation of America, Inc., accounted for approximately 27% of our total revenue for the fiscal year ended December 31, 2016. The loss of a significant customer or a significant reduction in the amount of product ordered by our significant customers may adversely affect our revenue, results of operations and cash flows. timely manner to compensate for any unexpected events or a shortfall in revenue. Accordingly, a shortfall in demand for our products or other unexpected events could have an immediate and material impact on our business and financial condition. Our credit facility requires that we satisfy certain milestones in order to access funding and contains restrictions that limit our flexibility in operating our business. In January 2015, we entered into a Loan and Security Agreement, or the LSA, with Solar Capital Partners (as successor-in-interest to General Electric Capital Corporation), and certain other lenders. Pursuant to the LSA, as amended, we borrowed $10 million in March 2015 and another $10 million in June 2016. We may borrow up to an additional $15 million if we timely obtain FDA clearance of our ePlex system. In addition, we have access to up to $5 million under a revolving credit facility, subject to certain conditions and a defined borrowing base. If we fail to satisfy the conditions to funding under our credit facility, including, but not limited to, as a result of our failure to timely achieve FDA clearance of our ePlex system, we may not have the ability to borrow additional amounts under our credit facility. We have a history of significant net losses and a limited history commercializing our molecular diagnostic products. Our net losses were approximately $50.6 million and $42.2 million for the years ended December 31, 2016 and 2015, respectively. As of December 31, 2016, we had an accumulated deficit of $355.3 million. We expect to continue to incur significant expenses for the foreseeable future in connection with our ongoing operations, primarily related to expanding our commercial organization (sales and marketing), research and development, manufacturing, clinical and regulatory activities related to our ePlex system, maintaining our existing intellectual property portfolio, obtaining additional intellectual property rights, and investing in corporate infrastructure. We cannot provide any assurance that we will achieve profitability and, even if we achieve profitability, that we will be able to sustain or increase profitability on a quarterly or annual basis. Further, because of our limited commercialization history and the rapidly evolving nature of our target market, we have limited insight into the trends that may emerge and affect our business. We may make errors in predicting and reacting to relevant business trends, which could harm our business and financial condition. 25 action items designed to make the process more rigorous and transparent. Some of these proposals, if enacted, could impose additional regulatory requirements for device manufacturers which could delay our ability to obtain new 510(k) clearances, increase the costs of compliance or restrict our ability to maintain our current clearances. Similarly, the European Union, or EU, is proposing to update the European Directive 98/79/EC on in vitro diagnostic medical device, or IVD Directive (IVDD), that could impact the classification of our molecular diagnostic products and result in additional regulatory requirements, which could delay our ability to CE Mark our products. Delays in receipt of, or failure to obtain, clearances or approvals for future products would result in delayed, or no, realization of revenues from such products and in substantial additional costs, which could decrease our profitability. We must also comply with the applicable FDA and foreign regulatory agency post-market requirements. Any failure to maintain post-market compliance with FDA or foreign regulatory requirements could harm our business, operations, and/or financial condition. We derive revenues from the sale of research use only, or RUO, tests and custom manufactured reagents, which are not intended for diagnostic purposes. Clinical laboratories are regulated under CLIA and may validate the clinical diagnostic use of an LDT specifically for use in their laboratory using any labeled products. The FDA has traditionally practiced enforcement discretion regarding the use of the LDTs for clinical diagnostic purposes. However, the FDA has recently promulgated draft guidance which outlines stringent regulatory requirements for CLIA labs in order to use LDTs for clinical diagnostic application. These proposed requirements, if implemented, may result in a significant reduction in the sale of our RUO or custom manufactured products, which could reduce our revenues and adversely affect our operations and/or financial condition. We currently manufacture our proprietary test cartridges at our Carlsbad, California manufacturing facilities. We outsource manufacturing of our instruments and much of the disposable component molding for our test cartridges. Leica, the contract manufacturer of our XT-8 instruments, and Plexus Corp., the contract manufacturer of our ePlex instrument, both specialize in the manufacturing of electronic and electro-mechanical devices. While we work closely with Plexus and Leica to ensure continuity of supply while maintaining high quality and reliability, we cannot guarantee that these efforts will be successful. The FCA imposes liability on persons who, among other things, present or cause to be presented false or fraudulent claims for payment by a federal health care program. The FCA has been used to prosecute persons submitting claims for payment that are inaccurate or fraudulent, that are for services not provided as claimed, or for services that are not medically necessary. We have implemented procedures designed to ensure our compliance with relevant legal requirements. Nevertheless, if our marketing, sales or other arrangements, including our reagent rental arrangements, were determined to violate anti-kickback or related laws, including the FCA, then our revenues could be adversely affected, which would likely harm our business, financial condition and results of operations. The Health Care Act also imposes reporting and disclosure requirements on device manufacturers for payments to healthcare providers and ownership of their stock by healthcare providers. In February 2013, the Centers for Medicine and Medicaid Services, or, CMS, released the final rule implementing the federal Physician Payments Sunshine Act, or the Sunshine Act. The law requires certain pharmaceutical, biologic, and medical device manufacturers to annually report to CMS payments or other transfers of value they furnish to physicians and teaching hospitals. These reporting requirements took effect on August 1, 2013. Failure to submit required information may result in significant civil monetary penalties. We expect compliance with the PPACA and Sunshine Act to impose significant administrative and financial burdens on us. Federal and state governments in the United States are undertaking efforts to control growing health care costs through legislation, regulation and voluntary agreements with medical care providers and third-party payors. In March 2010, Congress enacted the PPACA. While the PPACA involves expanding coverage to more individuals, it includes regulatory mandates and other measures designed to constrain medical costs. Among other requirements, the PPACA imposes a 2.3% excise tax on sales of medical devices by manufacturers. In December 2015, the excise tax was suspended for 2016 and 2017. Taxable devices include any medical device defined in Section 201(h) of the FDCA and intended for use by humans, with limited exclusions for devices purchased by the general public at retail for individual use. There is no exemption for small companies, and we paid the tax from 2013 through 2015. recently, Congress and the new administration have proposed and taken various steps to revise, repeal, or delay implementation of various aspects of PPACA. If the PPACA is significantly revised, repealed, or if implementation of various aspects are delayed, such modification, repeal, or delay may impact our business, financial condition, results of operations, cash flows and the trading price of our securities. Complying with PPACA may significantly increase our tax liabilities and costs, which could adversely affect our business and financial condition. In August 2011, President Obama signed into law the Budget Control Act of 2011, which among other things, created automatic reductions to several government programs, including aggregate reductions of Medicare payments to providers of up to 2% per fiscal year. In April 2013, the 2% Medicare payment reductions went into effect. In addition to the potential impacts to PPACA under the new administration, there could be sweeping changes to the Budget Control Act and other healthcare reforms. We expect that additional state and federal healthcare reform measures will be adopted in the future, any of which could limit the amounts that federal and state governments will pay for healthcare products and services, which could result in reduced demand for our products or additional pricing pressure. There is a significant amount of uncertainty regarding the extent of patent protection and infringement. Companies may have filed pending patent applications that cover technologies we incorporate in our products. As a result, we could be subjected to substantial damages for past infringement or be required to modify our products or stop selling them if it is ultimately determined that our products infringe a third party’s proprietary rights. Even if we are successful in defending against potential intellectual property infringement claims, we could incur substantial costs in doing so. Any litigation related to such claims could consume our resources and lead to significant damages, royalty payments, or an injunction on the sale of certain products. Any additional licenses to patented technology could obligate us to pay substantial additional royalties, which could adversely impact our product costs and harm our business. Our commercial success is dependent in part on obtaining, maintaining and enforcing intellectual property rights, including our patents and other intellectual property rights. If we are unable to obtain, maintain and enforce intellectual property protection covering our products, others may be able to make, use or sell products that are substantially the same as ours without incurring the sizeable development and licensing costs that we have incurred, which would adversely affect our ability to compete in the market. We seek to obtain and maintain patents and other intellectual property rights to restrict the ability of others to market products that compete with our products. Currently, our patent portfolio is comprised on a worldwide basis of more than 100 owned and exclusively licensed patents and approximately 30 additional pending patent applications. In general, patents have a term of at least 20 years from the application filing date or earlier claimed priority date. A majority of our issued and exclusively licensed patents are scheduled to expire by 2021, with approximately one half of the patents expiring by 2018. Several of our pending applications have the potential to mature into patents that may expire between 2028 and 2034. However, not all of the pending or future patent applications owned by or licensed to us are guaranteed to mature into patents, and, moreover, issued patents owned by or licensed to us now or in the future may be found by a court to be invalid or otherwise unenforceable. Also, even if our patents are determined by a court to be valid and enforceable, they may not be sufficiently broad to prevent others from marketing products similar to ours or designing around our patents, despite our patent rights, nor provide us with freedom to operate unimpeded by the patent rights of others. our trade secrets and proprietary knowledge. Any disclosure of confidential data into the public domain or to third parties could allow our competitors to learn our trade secrets and use the information in competition against us. Our manufacturing processes and facilities and those of some of our contract manufacturers must comply with the federal Quality System Regulation, or QSR, which covers the procedures and documentation of the design, testing, production, control, quality assurance, labeling, packaging, sterilization, storage and shipping of our devices. The FDA enforces the QSR through periodic announced and/or unannounced inspections of manufacturing facilities. We and our contract manufacturers have been, and anticipate in the future being, subject to such inspections, as well as to inspections by other federal and state regulatory agencies. In addition, a product defect or regulatory violation could lead to a government-mandated or voluntary recall by us. We believe that the FDA would request that we initiate a voluntary recall if a product was defective or presented a risk of injury or gross deception. Regulatory agencies in other countries have similar authority to recall devices because of material deficiencies or defects in design or manufacture that could endanger health. Any recall would divert management attention and financial resources, could cause the price of our common stock to decline and expose us to product liability or other claims, including contractual claims from parties to whom we sold products, and harm our reputation with customers. If our customers are not adequately reimbursed or compensated for the use of our products we may have difficulty selling our products. purchasers or users of our products are not able to obtain adequate reimbursement for the cost of using our products, either directly or indirectly, they may forego or reduce their purchase and use of our products. Obtaining coverage and reimbursement approval for a product from each government or third-party payor is a time consuming and costly process that could require us to provide supporting scientific, clinical and cost-effectiveness data for the use of our product to each government or third-party payor. We may not be able to provide data sufficient to gain acceptance with respect to coverage and reimbursement. In addition, eligibility for coverage does not imply that any product will be covered and reimbursed in all cases or reimbursed at a rate that allows our potential customers to make a profit or even cover their costs. Further, third-party payors may choose to reimburse our customers per test based on individual biomarker detection, rather than on the basis of the number of results given by the test. This may result in our customers electing to use separate tests to screen for each disease or condition so that they can receive reimbursement for each test they conduct. In that event, these entities may purchase separate tests for each disease, rather than products, such as ours, that can be used to return highly multiplexed test results. We are currently reliant on the commercial success of our XT-8 system and its related test menu to partially fund our current operations and ePlex development programs. We currently market our XT-8 instrument and four FDA-cleared diagnostic tests. In addition, we sell RUO tests and custom manufactured reagents. We have primarily placed our XT-8 systems with customers at no initial charge through reagent rental agreements, under which customers generally commit to purchase minimum quantities of test cartridges and reagents (consumables) over a typical period of one to three years, with a component of the cartridge and reagent price allocated to recover the instrument price. We also offer our XT-8 systems for sale. As a result, to the extent that our XT-8 system and our existing and future products are not commercially successful or are withdrawn from the market for any reason, our operating results, financial condition and critical ePlex development programs would be harmed and we may be required to seek additional funding to support our ongoing operations. Some hospital-based and reference laboratories may not consider adopting our XT-8 system unless we offer a broader menu of diagnostic tests or may choose not to convert from competitive products unless and until we are able to offer a sample-to-answer instrument solution, such as our ePlex instrument. In addition, in order to commercialize our products, we are required to undertake time consuming and costly development activities, including clinical studies for which the outcome is uncertain. Products that appear promising during early development and preclinical studies may, nonetheless, fail to demonstrate the results needed to support regulatory approval or, if approved, may not generate the demand we expect. If we are unable to effectively compete with our XT-8 system and its related test menu, our revenues and our ability to achieve profitability will be significantly impaired. As a public company listed in the United States, we incur significant legal, accounting and other expenses. In addition, changing laws, regulations and standards relating to corporate governance and public disclosure, including regulations implemented by the SEC, the Public Company Accounting Oversight Board (PCAOB), and The NASDAQ Global Market, may increase our legal and financial compliance costs and make some activities more time consuming. These laws, regulations and standards are subject to varying interpretations and, as a result, their application in practice may evolve over time as new guidance is provided by regulatory and governing bodies. We intend to invest resources to comply with evolving laws, regulations and standards, and this investment may result in increased general and administrative expenses and a diversion of management’s time and attention from revenue-generating activities to compliance activities. If we nevertheless fail to comply with new laws, regulations and standards, regulatory authorities may initiate legal proceedings against us and our business may be harmed. Many of our systems are provided to customers via “reagent rental” agreements, under which customers are afforded the right to use the instrument in return for a commitment to purchase minimum quantities of reagents and test cartridges over a period of time. Accordingly, we must either incur the expense of manufacturing instruments well in advance of receiving sufficient revenues from test cartridges to recover our expenses or obtain third party financing sources for the purchase of our instrument. The amount of capital required to provide instrument systems to customers depends on the number of systems placed. Our ability to generate capital to cover these costs depends on the amount of our revenues from sales of reagents and test cartridges sold through our reagent rental agreements. We do not currently sell enough reagents and test cartridges to recover all of our fixed expenses, and therefore we currently have a net loss. If we cannot sell a sufficient number of reagents and test cartridges to offset our fixed expenses, our liquidity will continue to be adversely affected. cannot predict the impact on our business of new or amended environmental laws or regulations or any changes in the way existing and future laws and regulations are interpreted and enforced. In the ordinary course of our business, we generate, collect and store proprietary information, including intellectual property and business information. The secure storage, maintenance, and transmission of and access to this information is critical to our operations, business strategy, and reputation. Computer hackers may attempt to penetrate our computer systems or our third party IT service providers' systems and, if successful, misappropriate our proprietary information. In addition, an employee, contractor, or other third-party with whom we do business may attempt to circumvent our security measures in order to obtain such information, and may purposefully or inadvertently cause a breach involving such information. While we will continue to implement additional protective measures to reduce the risk of and detect cyber-attacks, these incidents are becoming more sophisticated and frequent, and the techniques used in such attacks evolve rapidly and are difficult to detect. Despite our cybersecurity measures, our information technology networks and infrastructure may still be vulnerable to unpermitted access by hackers or other breaches, or employee error or malfeasance. Any such compromise of our, or our third party IT service providers' data security and access to, or public disclosure or loss of, confidential business or proprietary intellectual property information could disrupt our operations, damage our reputation, provide our competitors with valuable information, and subject us to additional costs which could adversely affect our business. As of December 31, 2016, we had net operating loss, or NOL, carryforwards available of approximately $206.9 million for U.S. federal income tax purposes. These loss carryforwards will expire in varying amounts through 2035. Section 382 of the U.S. Internal Revenue Code of 1986, as amended, or the Code, generally imposes an annual limitation on the amount of NOL carryforwards that may be used to offset taxable income when a corporation has undergone significant changes in stock ownership. We have determined that we have experienced multiple ownership changes under Section 382 of the Code. Our ability to use the current NOL carryforwards may also be limited by the issuance of common stock in the future. To the extent our use of NOL carryforwards is limited, our income may be subject to corporate income tax earlier than it would if we were able to use NOL carryforwards. We have recorded a full valuation allowance against our net deferred tax assets. We also had state NOL carryforwards of approximately $165.0 million as of December 31, 2016. We have recorded a full valuation allowance against our net deferred tax assets. We currently operate from two facilities, each of which is located in Carlsbad, California. We do not own any real property. In February 2010, we entered into a lease for an approximately 31,000 square foot facility in Carlsbad, California, the term of which originally ran through September 2017. The facility is part of a three-building office and research and development project located at 5964 La Place Court, Carlsbad, California. In January 2012, we signed a lease amendment which expanded our executive and administrative office, research and development, and manufacturing space by approximately 22,000 additional square feet and extended the term of the lease through June 2021. In June 2015, we leased an additional 34,000 square feet at a nearby location in Carlsbad, California, which we utilize primarily for ePlex manufacturing operations. The term of the lease runs through September 2023, and we have an option to extend the term of the lease for an additional five years. We believe that our currently leased facilities are adequate to meet our needs for the foreseeable future. Our common stock has been quoted on The NASDAQ Global Market under the symbol “GNMK” since May 28, 2010. The following table sets forth for the indicated periods the high and low sales prices per share of our common stock as reported on The NASDAQ Global Market. 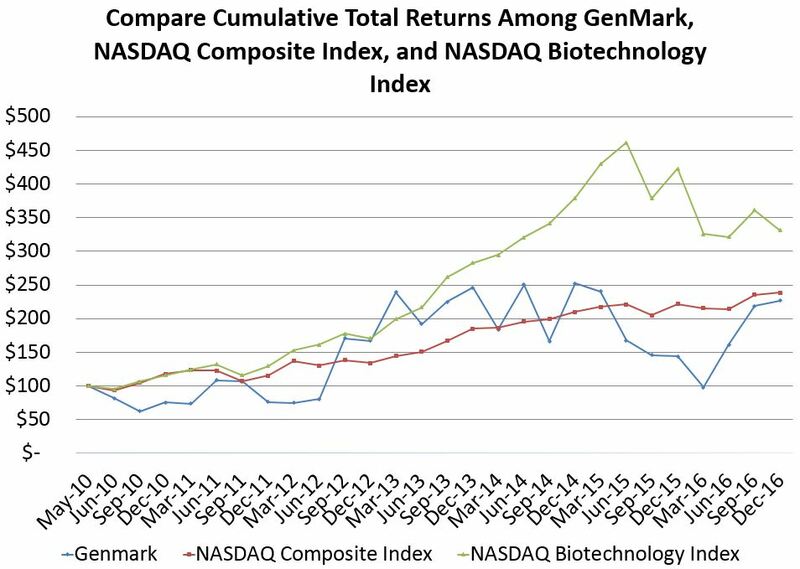 The graph below compares the cumulative total stockholder returns on our common stock for the period indicated with the cumulative total stockholder returns on the NASDAQ Composite Index and the NASDAQ Biotechnology Index for the same period. The graph assumes that $100 was invested on May 28, 2010 in our common stock and in each index and that all dividends were reinvested. No cash dividends have been declared on our common stock. Stockholder returns over the indicated period should not be considered indicative of future stockholder returns. The last reported sale price of our common stock on February 24, 2017 as reported on the NASDAQ Global Market was $11.25. As of February 24, 2017, there were 2,693 holders of record of our common stock. We have never declared or paid any cash dividends on our common stock and do not expect to pay any dividends for the foreseeable future. In addition, our LSA with Solar Capital Partners contains a negative covenant which may limit our ability to pay dividends. We currently intend to retain any future earnings to fund the operation, development and expansion of our business. Any future determination to pay dividends will be at the sole discretion of our Board of Directors and will depend upon a number of factors, including our results of operations, capital requirements, financial condition, future prospects, contractual arrangements, restrictions imposed by applicable law, any limitations on payments of dividends present in our current and future debt arrangements, and other factors our Board of Directors may deem relevant. The following selected consolidated financial data relates to GenMark Diagnostics, Inc. and its consolidated subsidiaries. The selected consolidated statement of net loss data presented below of GenMark Diagnostics, Inc. for the years ended December 31, 2016, 2015, and 2014 and the selected consolidated balance sheet data of GenMark Diagnostics, Inc. as of December 31, 2016, and 2015 have been derived from the audited consolidated financial statements of GenMark Diagnostics, Inc., which have been prepared in accordance with generally accepted accounting principles in the United States, or U.S. GAAP, included elsewhere in this Annual Report. The selected consolidated statement of comprehensive loss data presented for the years ended December 31, 2013 and 2012 and the selected consolidated balance sheet data as of December 31, 2014, 2013, and 2012 have been derived from audited financial statements not included in this Annual Report. The results for the periods shown below are not necessarily indicative of the results to be expected for any future periods. The selected consolidated financial data should be read together with the “Management’s Discussion and Analysis of Financial Condition and Results of Operations” section and with the consolidated financial statements and condensed consolidated financial statements of GenMark Diagnostics, Inc. and related notes included elsewhere in this Annual Report. In August and September 2016, we issued approximately 8.3 million shares of common stock at an average price of $9.04 per share. We raised approximately $29.1 million in net proceeds. In August 2013, we issued approximately 8.7 million shares of common stock at a price of $9.84 per share. We raised approximately $81.0 million in net proceeds. In June 2012, we issued approximately 11.5 million shares of common stock at a price of $4.20 per share. We raised approximately $45.1 million in net proceeds. You should read the following in conjunction with the “Selected Consolidated Financial Data” and the consolidated financial statements of GenMark and the related notes thereto that appear elsewhere in this Annual Report. In addition to historical information, the following discussion and analysis includes forward looking information that involves risks, uncertainties and assumptions. Actual results and the timing of events could differ materially from those anticipated by these forward looking statements as a result of many factors, including those discussed under the heading “Risk Factors” included elsewhere in this Annual Report. See also “Forward Looking Statements” included elsewhere in this filing. GenMark was formed by Osmetech ptc, or Osmetech, as a Delaware corporation in February 2010, and had no operations prior to its initial public offering, which was completed in June 2010. Immediately prior to the closing of the initial public offering, GenMark acquired all of the outstanding ordinary shares of Osmetech in a reorganization under the applicable laws of the United Kingdom. Following the reorganization, Osmetech became a wholly-owned subsidiary controlled by GenMark, and the former shareholders of Osmetech received shares of GenMark. Any historical discussion of GenMark relates to Osmetech and its consolidated subsidiaries prior to the reorganization. In September 2012, GenMark placed Osmetech into liquidation to simplify its corporate structure. The liquidation of Osmetech was competed in the fourth quarter of 2013. Since inception, we have incurred net losses from operations each year, and we expect to continue to incur losses for the foreseeable future. Our net losses for the years ended December 31, 2016, 2015, and 2014 were approximately $50.6 million, $42.2 million, and $38.3 million, respectively. As of December 31, 2016, we had an accumulated deficit of $355.3 million. Our operations to date have been funded principally through sales of capital stock, borrowings, and cash from operations. We expect to incur increasing expenses over the next several years, principally to develop and commercialize our ePlex system and additional diagnostic tests, as well as to further increase our manufacturing capabilities and domestic and international commercial organization. We offer four FDA-cleared diagnostic tests which run on our XT-8 instrument: our Respiratory Viral Panel; our Cystic Fibrosis Genotyping Test; our Warfarin Sensitivity Test; and our Thrombophilia Risk Test. We also offer an HCV genotyping test and associated custom manufactured reagents, as well as a 2C19 Genotyping Test, versions of which are available for use with our XT-8 instrument for research use only (RUO). In addition, we have commercially launched in Europe our sample-to-answer ePlex instrument and RP Panel, which integrates automated nucleic acid extraction and amplification with our eSensor detection technology to enable operators using ePlex to place a raw or a minimally prepared patient sample directly into our test cartridge and obtain results without any additional steps. This sample-to-answer capability is enabled by the robust nature of our eSensor detection technology, which is not impacted to the same degree by sample impurities that we believe hinder competing technologies. We have designed our ePlex system to further simplify workflow and provide powerful, cost-effective molecular diagnostics solutions to a significantly expanded group of hospitals and reference laboratories. We obtained CE Mark for our ePlex system and RP Panel in June 2016, and filed 510(k) applications with the FDA for the ePlex instrument and RP Panel in December 2016. During 2017, we intend to complete the development of, CE Mark, and submit 510(k) applications to the FDA our ePlex blood culture identification (BCID) family of panels, which include a gram-positive (GP), a gram-negative (GN), and a fungal pathogen panel. In addition, we are actively evaluating the development of additional assay panels that we believe will meet important, unmet clinical needs, which our ePlex system is uniquely positioned to address. Revenue from operations includes product sales, principally of our diagnostic tests. We primarily place our instruments with customers through a reagent rental agreement, under which we retain title to the instrument and customers commit to purchasing minimum quantities of reagents and test cartridges over a period of one to three years. We also offer our instruments for sale. Cost of revenues includes the cost of materials, direct labor and manufacturing overhead costs used in the manufacture of our consumable tests, including royalties on product sales. Cost of revenues also includes depreciation on revenue generating instruments that have been placed with our customers under a reagent rental agreement, cost of instruments sold to customers, amortization of licenses related to our products and other costs such as warranty, royalty and customer and product technical support. We manufacture our test cartridges in our facility and have recently invested in significant capacity for expansion. Any potential underutilized capacity may result in a high cost of revenues relative to revenue, if manufacturing volumes are not able to fully absorb operating costs. Our instruments are procured from contract manufacturers. We expect our cost of revenues to increase as we place additional instruments and manufacture and sell additional diagnostic tests; however, we expect gross margins related to our products will increase as production volumes, manufacturing efficiencies, improved procurement practices, instrument reliability increases and other improvements decrease costs as a percentage of sales. Sales and marketing expenses include costs associated with our direct sales force, sales management, marketing, technical support and business development activities. These expenses primarily consist of salaries, commissions, benefits, stock-based compensation, travel, advertising, promotions, product samples and trade show expenses. We expect sales and marketing expenses to increase as we increase our domestic and international commercial efforts to expand our customer base. Research and development expenses primarily include costs associated with the development of our ePlex instrument and its test menu. These expenses also include certain clinical study expenses incurred in preparation for FDA clearance for these products, intellectual property prosecution and maintenance costs, and quality assurance expenses. The expenses primarily consist of salaries, benefits, stock-based compensation, outside design and consulting services, laboratory supplies and equipment, costs of consumables and materials used in product development, contract research organization costs, clinical studies and facility costs. We expense all research and development costs in the periods in which they are incurred. Our general and administrative expenses include expenses related to our executive, accounting and finance, compliance, information technology, legal, facilities, human resource, administrative and investor relations activities. These expenses consist primarily of salaries, benefits, stock-based compensation costs, independent auditor costs, legal and consulting fees, and travel, insurance, and public company expenses, such as stock transfer agent fees and listing fees for NASDAQ. first step is to evaluate the tax position for recognition by determining if the weight of available evidence indicates that it is more likely than not that the position will be sustained on audit, including resolution of related appeals or litigation processes, if any. The second step is to measure the tax benefit as the largest amount that is more than 50% likely of being realized upon settlement. While we believe we have appropriate support for the positions taken on our tax returns, we regularly assess the potential outcomes of examinations by tax authorities in determining the adequacy of our provision for income taxes. We continually assess the likelihood and amount of potential adjustments and adjust the income tax provision, income taxes payable, and deferred taxes in the period in which the facts that give rise to a revision become known. We recognize revenue from product sales and contractual arrangements, net of discounts and sales related taxes. We recognize revenue from product sales when there is persuasive evidence that an arrangement exists, delivery has occurred, the price is fixed or determinable and collectability is reasonably assured. Where applicable, all revenue is stated net of sales taxes and trade discounts. Revenue related to royalties received from licenses is generally recognized evenly over the contractual period to which the license relates. In those cases where we bill shipping and handling costs to customers, the amounts billed are classified as other revenue. We offer customers the choice to either purchase an instrument outright or to receive possession of an instrument free of charge in exchange for a commitment to purchase an annual minimum amount of molecular diagnostic test cartridges. When an instrument is sold, revenue is generally recognized upon shipment of the unit consistent with contract terms. When an instrument is placed free of charge under a "reagent rental" agreement, we retain title to the instrument and it remains capitalized on our balance sheet under property and equipment. Under our reagent rental agreements, our customers pay an instrument usage fee, which is included in the price of each test cartridge purchased. Our reagents and diagnostic test cartridges (consumables) are priced to include the expense of instrument usage and maintenance and are included in product revenue in our consolidated financial statements. We sell our durable instruments and disposable test cartridges through a direct sales force in the United States and certain European countries and through distributor arrangements in other European jurisdictions. The instrument price is not dependent upon the purchase of any amount of disposable test cartridges. Revenue on instrument and test cartridge sales is generally recognized upon shipment consistent with contract terms, which is when title and the risk of loss and rewards of ownership have been transferred to the customer and there are no other post-shipment obligations. We maintain an allowance for doubtful accounts for estimated losses resulting from the inability of our customers to make required payments. Our allowance for doubtful accounts is based on our assessment of the collectability of specific customer accounts, the aging of accounts receivable, and the general condition of the economy. Changes in our allowance for doubtful accounts are charged to sales and marketing expense. We value inventories at the lower of cost or net realizable value on a part-by-part basis and provide an inventory reserve for estimated obsolescence and excess inventory based upon historical turnover and assumptions about future demand for our products and market conditions. We determine excess and obsolete inventories based on an estimate of the future demand for our products within a specified time horizon, which is generally 12 months. The estimates we use for demand are also used for near-term capacity planning and inventory purchasing and are consistent with our revenue forecasts. If our actual demand is less than our forecast demand, we may be required to take additional excess inventory charges, which would decrease gross margin and adversely impact net operating results in the future. Property, equipment and leasehold improvements are recorded at cost and depreciated using the straight-line method over the assets’ estimated useful lives, which are noted below. Each category of property and equipment is analyzed to determine its useful life. We look at the manufacturers’ estimates of useful life and adjust these for actual experience in our operating environment. Useful lives are reviewed periodically and occasionally changed as circumstances dictate. Repair and maintenance costs are expensed as incurred. During 2016, 2015 and 2014, we disposed of certain assets no longer in use with a net book value of $76,000, $153,000 and $102,000, respectively, recorded to cost of revenue, sales and marketing, research and development, or general and administrative expenses based on the asset's respective use. We assess the recoverability of long-lived assets, including intangible assets and instruments at customer locations by periodically evaluating the carrying value of such assets whenever events or changes in circumstances indicate that the carrying amount of these assets may not be recoverable. If impairment is indicated, we write down the carrying value of the asset to the estimated fair value. Expected Term. The expected term represents the period that our stock-based awards are expected to be outstanding and is determined by using the simplified method. Expected Volatility. Expected volatility represents the expected volatility in our stock price over the expected term of the stock option or award. Expected Dividend. The pricing models require a single expected dividend yield as an input. We assumed no dividends as we have never paid dividends and have no plans to do so. Risk-Free Interest Rate. The risk-free interest rates used in the models is based on published government rates in effect at the time of grant for periods corresponding with the expected term of the option or award. Our income tax expense, deferred tax assets and liabilities, and reserves for unrecognized tax benefits reflect management’s best assessment of estimated future taxes to be paid. We file income tax returns in the United States, Switzerland, Germany, the United Kingdom, France, and various state jurisdictions. Significant judgments and estimates are required in determining our consolidated income tax expense. We believe that it is more likely than not that the benefit from our deferred tax assets will not be realized. In recognition of this risk, we have provided a full valuation allowance on the net deferred tax assets relating to our net operating loss carryforwards and other deferred tax assets. If our assumptions change and we determine that we will be able to realize our deferred tax assets, the tax benefits relating to any reversal of the valuation allowance on deferred tax assets will be accounted for as a reduction of income tax expense. our current estimate of the tax liabilities. These differences will be reflected as increases or decreases to income tax expense in the period in which they are determined. For a summary of recent accounting pronouncements applicable to our consolidated financial statements see Note 2, "Summary of Significant Accounting Policies and Significant Accounts" to the Consolidated Financial Statements in Part II, Item 8 of this Annual Report. Our revenue consists primarily of revenue from the sale of test cartridges and reagents (consumables), with a small component from our sale of instruments and other revenue. For the year ended December 31, 2016, our revenue grew 25%, or $9,863,000, compared to 2015. Consumables revenue during the year ended December 31, 2016 increased by 23% to $46,946,000, compared to $38,061,000 in the prior year. This increase in consumable revenue was primarily driven by increased product purchases by several key customers. Pricing changes did not have a significant impact on revenue during the current period. Additionally, during the year ended December 31, 2016, instrument revenue increased $957,000 compared to the same period of the prior year, primarily due to the sale of ePlex instruments. For the year ended December 31, 2015, our revenue grew 29%, or $8,817,000, compared to 2014. Consumables revenue during the year ended December 31, 2015 increased by 30% to $38,061,000 compared to $29,235,000 in the prior year. This increase in consumable revenue was primarily driven by increases in our installed base of XT-8 analyzers over the prior year period. Pricing changes did not have an impact on revenue during 2015. The increase in cost of revenue for the twelve months ended December 31, 2016 compared to the twelve months ended December 31, 2015 was primarily related to the increase in consumables revenue in the current year. Increases in our cost of revenue were attributable to product costs of $3,177,000, increased product warranty and support expenses of $519,000, and increased royalty expense of $431,000 corresponding to sales volume increases, less favorable manufacturing yields and variances of $235,000, and increased overhead expenses of $412,000, partially offset by decreased inventory reserve expense of $387,000. The improvement to gross profit during the year ended December 31, 2016, compared to December 31, 2015, was primarily due to increased sales of higher margin products. The increase in cost of revenue for the twelve months ended December 31, 2015 compared to the twelve months ended December 31, 2014 was primarily related to the increase in consumables revenue during 2015. Increases in our cost of revenue in 2015 were attributable to product costs of $2,548,000 corresponding to sales volume increases, the expansion of our customer technical support group of $200,000, increased warranty reserve of $144,000, and increased royalty expense of $138,000, partially offset by greater manufacturing efficiencies of $761,000. The improvement to gross profit during the year ended December 31, 2015, compared to December 31, 2014, was primarily due to increased sales of higher margin products and a reduction in manufacturing personnel costs. Sales and marketing expenses primarily comprise employee-related expenses for our domestic and international commercial organization, and marketing communication and trade show expenses. The increase in sales and marketing expense for the year ended December 31, 2016, compared to the year ended December 31, 2015, was primarily driven by increased marketing and trade show expense of $582,000, increased freight and postage expense of $184,000, and increased travel expenses of $112,000 incurred in connection with expanding our domestic and international commercial organization, partially offset by a decrease in employee-related expenses of $522,000. The increase in sales and marketing expense for the year ended December 31, 2015, compared to the year ended December 31, 2014, was primarily driven by a $1,747,000 increase in employee-related expenses, including increased stock-based compensation expense of $1,187,000, incurred in connection with expanding our domestic and international commercial organization. The increase in general and administrative expense for the year ended December 31, 2016 compared to the year ended December 31, 2015 was primarily driven by an increase in employee-related expenses of $536,000, an adjustment to our indirect tax accrual of $274,00, and an increase in travel-related expenses of $168,000, partially offset by a decrease in medical device tax expense of $447,000 as a result of the suspension of the excise tax in December 2015. The increase in general and administrative expense for the year ended December 31, 2015 compared to the year ended December 31, 2014 was primarily due to increased employee-related expenses of $1,966,000, including increased stock-based compensation expense of $1,559,000, and increased medical device tax of $447,000 as a result of higher product sales, partially offset by a $138,000 decrease in consultant and outside service costs and decreased legal expenses of $77,000. The increase in research and development expense for the year ended December 31, 2016, compared to the year ended December 31, 2015, was primarily driven by increased materials, equipment and consumables used in the development and expansion of our ePlex test menu totaling $10,523,000, increased employee-related expenses of $2,993,000, and increased clinical trials expense of $887,000, partially offset by reduced outside services expenditures of $3,420,000. The increase in research and development expense for the year ended December 31, 2015, compared to the year ended December 31, 2014, was primarily due to increased ePlex assay development expenses of $3,993,000, increased clinical trials and quality assurance expenses of $897,000, and an increase in ePlex instrument expenses of $663,000. Overall increases in research and development expenses were attributable to employee-related expenses, clinical trials expenses, and supplies and other materials to support our ePlex system and its related test menu. Other income (expense) represents non-operating income and expense, including, but not limited to, earnings on cash, cash equivalents, marketable securities, and interest expense related to debt. The change in other income (expense) for the year ended December 31, 2016, compared to the year ended December 31, 2015, was due primarily to an increase in interest expense of $655,000 under our debt facility, and a decrease in income as a result of less interest earned on marketable securities of $217,000 in the current period. The change in other income (expense) for the year ended December 31, 2015, compared to the year ended December 31, 2014, was due primarily to an increase in interest expense of $860,000 under our debt facility, a decrease in income as a result of less interest earned on marketable securities of $119,000, and an $84,000 increase in unrealized foreign currency losses as a result of our expanding international operations, partially offset by income from a one-time payment of $223,000 received from the release of escrowed proceeds related to our sale of a preferred stock investment in the fourth quarter of 2014. Due to net losses incurred domestically, the tax provisions recorded relate to minimum tax payments in the United States. We have recorded tax liabilities related to income earned in local jurisdictions by our foreign subsidiaries. The increase in income tax expense for the year ended December 31, 2016, compared to the year ended December 31, 2015, was primarily a result of international income taxes. The increase in income tax expense for the year ended December 31, 2015 was primarily due to the expiration of the statue of limitations on uncertain tax positions resulting in the recognition of a $610,000 tax benefit in 2014. To date we have funded our operations primarily from the sale of our common stock, borrowings and cash from operations. We have incurred net losses from operations each year and have not yet achieved profitability. At December 31, 2016, we had $32,028,000 of working capital, including $41,566,000 in cash, cash equivalents, and marketable securities. Net cash used in operating activities increased $3,722,000 to $35,637,000 for the year ended December 31, 2016, compared to $31,915,000 for the year ended December 31, 2015. The increase in cash used in operating activities was primarily due to an $8,404,000 increase in our net loss and $535,000 in lower non-cash charges primarily comprised of stock-based compensation expense, partially offset by an additional $5,217,000 cash inflow from changes in operating assets and liabilities. The main drivers in the change in operating assets and liabilities included increases in accounts payable, accrued compensation and other liabilities and increases in inventory and accounts receivable. Net cash used in operating activities increased $2,343,000 to $31,915,000 for the year ended December 31, 2015, compared to $29,572,000 for the year ended December 31, 2014. The increase in cash used in operating activities was primarily due to a $3,934,000 increase in net loss and $4,658,000 in lower non-cash charges primarily related to less bad debt expense and impairment, partially offset by $3,067,000 of less cash outflow from changes in operating assets and liabilities. Net cash used in investing activities for the year ended December 31, 2016, compared to the year ended December 31, 2015, increased $43,444,000 primarily due to a $36,000,000 decrease from the maturity of short-term marketable securities, an increase in purchases of marketable securities of $11,042,000, and increased purchase of property, plant, equipment and licenses of $4,194,000, partially offset by a $7,792,000 increase in proceeds from the sale of marketable securities. Net cash provided by investing activities for the year ended December 31, 2015, compared to the year ended December 31, 2014, decreased $10,096,000 primarily due to a $10,000,000 decrease from the maturity of short-term marketable securities and a $7,274,000 decrease in proceeds from the sale of marketable securities related to our sale of a preferred stock investment, partially offset by a decrease in purchases of marketable securities of $5,408,000. generated from from an at-the-market equity offering described in greater detail below, and an absence of debt issuance costs of $628,000 incurred in the prior year, partially offset by a decrease in proceeds from the exercise of employee stock options of $277,000. Net cash provided by financing activities increased $9,846,000 to $11,133,000 for the year ended December 31, 2015, compared to $1,287,000 for the year ended December 31, 2014, primarily due to the borrowing of $10,000,000 under our debt facility and $458,000 in higher proceeds from stock option exercises, partially offset by $718,000 in costs associated with debt issuance. up to $5,000,000 in the form of a revolving loan, which is subject to a defined borrowing base as set forth in the LSA. In July 2016, we entered into an amendment to the LSA pursuant to which the lenders internally reallocated certain funding commitments under the LSA between the lenders, and the parties extended the date by which the future funding requirements in respect of Term Loan C must be satisfied. In February 2017, we entered into an amendment to the LSA pursuant to which the parties further extended the date by which the future funding requirements in respect of Term Loan C must be satisfied. In addition, the parties agreed to extend the interest-only period in respect of amounts already borrowed under Term Loan A and Term Loan B, as well as the amounts, if any, we may borrow pursuant to Term Loan C.
creation of liens, the incurrence of indebtedness, and the making of certain investments, payments and acquisitions, other than as specifically permitted by the LSA. On June 14, 2016, we entered into an Equity Distribution Agreement, or the Distribution Agreement, with Canaccord Genuity Inc., as sales agent, or Canaccord, pursuant to which we could, at our discretion, offer and sell, from time to time, through Canaccord shares of our common stock having an aggregate offering price of up to $30.0 million. Under the Distribution Agreement, Canaccord could sell shares by any method deemed to be an “at-the-market” offering as defined in Rule 415 under the Securities Act or any other method permitted by law, including in privately negotiated transactions. We began sales under the Distribution Agreement in August 2016 pursuant to an effective shelf registration statement on Form S-3 previously filed with the SEC. During the three months ended September 30, 2016, we sold 3.3 million shares of our common stock, at an average per share price of $9.04, for aggregate gross proceeds of $30.0 million. We incurred $1,143,000 in related transaction costs, comprising commissions paid to Canaccord of 3.0% of the aggregate gross proceeds from each sale of shares occurring pursuant to the Distribution Agreement, or $900,000, and $243,000 in additional miscellaneous expenses. In September 2012, we provided a $758,000 letter of credit issued by Banc of California to the landlord of our executive office facility in Carlsbad, California. This letter of credit was secured with $758,000 of restricted cash at December 31, 2016. If we require additional capital, we cannot be certain that it will be available when needed or that our actual cash requirements will not be greater than anticipated. If we raise additional funds through the issuance of equity or convertible debt securities, the percentage ownership of our stockholders could be significantly diluted, and these newly issued securities may have rights, preferences or privileges senior to those of existing stockholders. If we raise additional funds through collaborations or licensing arrangements, we may be required to relinquish significant rights to our technologies or products, or grant licenses on terms that are not favorable to us. We enter into leases in the ordinary course of business with respect to facilities. Our lease agreements have fixed payment terms based on the passage of time. Certain facility leases require payment of maintenance and real estate taxes. Our future operating lease obligations could change if we terminate certain contracts or if we enter into additional leases. In January 2012, we entered into a lease amendment with the landlord of our Carlsbad, California executive office facility to rent an additional 22,000 square feet. The lease amendment required an additional security deposit of $22,000 and an increase in our standby letter of credit to $758,000. We took possession of the additional space on January 1, 2013, at which time the rent increased by approximately $35,000 per month, subject to annual increases of between 3% and 4%. The term of the lease was also extended to June 30, 2021. In August 2012, we entered into a three-year supply agreement with Leica for the purchase of our XT-8 instrument. Amounts reported in the table above reflect minimum purchase commitments under this supply agreement which we can satisfy through instrument purchases or the payment of a designated fee for each instrument we fail to purchase under the prescribed minimum amounts, subject to certain permitted exclusions. In December 2015, we entered into a manufacturing and supply agreement with Plexus for the purchase of our ePlex instrument. Amounts reported in the table above reflect the current minimum purchase commitments under this supply agreement, which we satisfy through instrument and component part purchases. In June 2015, we entered into a lease agreement for additional manufacturing space located in Carlsbad, California. Pursuant to the lease agreement, rent payments total $4,490,000 over the 90-month lease term. The effect of inflation and changing prices on our operations was not significant during the periods presented. We have no off-balance sheet arrangements. We have provided a $758,000 standby letter of credit to our landlord as security for future rent in connection the lease of our Carlsbad, California corporate headquarters, which is recorded as restricted cash on our consolidated balance sheet. Our exposure to market risk is limited to our cash and cash equivalents, all of which have maturities of less than three months, and marketable securities, which have maturities of less than one year. The goals of our investment policy are preservation of capital, fulfillment of liquidity needs, and fiduciary control of cash and investments. We also seek to maximize income from our investments without assuming significant risk. To achieve our goals, we may in the future maintain a portfolio of cash equivalents and investments in a variety of securities that management believes to be of high credit quality. We currently do not hedge interest rate exposure. Because of the short-term maturities of our cash equivalents and short-term investments, we do not believe that an increase in market rates would have a material negative impact on the value of our portfolio. As of December 31, 2016, based on current interest rates and total debt outstanding, a hypothetical 100 basis point increase or decrease in interest rates would have an insignificant pre-tax impact on our results of operations. We are a U.S. entity and our functional currency is the U.S. dollar. Substantially all of our revenues were derived from sales in the United States. We have business transactions in foreign currencies, however, we believe we do not have significant exposure to risk from changes in foreign currency exchange rates at this time. We do not currently engage in hedging or similar transactions to reduce our foreign currency risks. We will continue to monitor and evaluate our internal processes relating to foreign currency exchange, including the potential use of hedging strategies. The Board of Directors and Stockholders of GenMark Diagnostics, Inc.
We have audited the accompanying consolidated balance sheets of GenMark Diagnostics, Inc. as of December 31, 2016 and 2015, and the related consolidated statements of comprehensive loss, stockholders' equity and cash flows for each of the three years in the period ended December 31, 2016. These financial statements are the responsibility of the Company's management. Our responsibility is to express an opinion on these financial statements based on our audits. In our opinion, the financial statements referred to above present fairly, in all material respects, the consolidated financial position of GenMark Diagnostics, Inc. at December 31, 2016 and 2015, and the consolidated results of its operations and its cash flows for each of the three years in the period ended December 31, 2016, in conformity with U.S. generally accepted accounting principles. We also have audited, in accordance with the standards of the Public Company Accounting Oversight Board (United States), GenMark Diagnostics, Inc.'s internal control over financial reporting as of December 31, 2016, based on criteria established in Internal Control-Integrated Framework issued by the Committee of Sponsoring Organizations of the Treadway Commission (2013 framework) and our report dated February 28, 2017 expressed an unqualified opinion thereon. GenMark Diagnostics, Inc., the Company or GenMark, was formed by Osmetech plc, or Osmetech, as a Delaware corporation in February 2010, and had no operations prior to its initial public offering, or the IPO, which was completed in June 2010. Immediately prior to the closing of the IPO, GenMark acquired all of the outstanding ordinary shares of Osmetech in a reorganization, accounted for in a manner similar to a pooling-of-interests, under the applicable laws of the United Kingdom. As a result of the reorganization, all of the issued ordinary shares in Osmetech were cancelled in consideration of (i) the issuance of common stock of GenMark to the former shareholders of Osmetech and (ii) the issuance of new shares in Osmetech to GenMark. Following the reorganization, Osmetech became a subsidiary controlled by GenMark, and the former shareholders of Osmetech received shares of GenMark. Any historical discussion of GenMark relates to Osmetech and its consolidated subsidiaries prior to the reorganization. In September 2012, GenMark placed Osmetech into liquidation to simplify its corporate structure. The liquidation of Osmetech was completed in the fourth quarter of 2013. The Company currently operates as one operating segment. Operating segments are defined as components of an enterprise for which separate financial information is evaluated regularly by the chief operating decision maker, who is the chief executive officer, in deciding how to allocate resources and assessing performance. The Company’s business operates in one operating segment because the Company’s chief operating decision maker evaluates the Company’s financial information and resources and assesses the performance of these resources on a consolidated basis. Since the Company operates in one operating segment, all required financial segment information can be found in the consolidated financial statements. The preparation of consolidated financial statements in conformity with accounting principles generally accepted in the United States of America, or U.S. GAAP, requires management to make estimates and assumptions that affect the amounts reported in the financial statements and the notes thereto. The Company’s significant estimates included in the preparation of the financial statements are related to accounts receivable, inventories, property and equipment, intangible assets, employee related compensation accruals, warranty liabilities, tax valuation accounts and stock-based compensation. Actual results could differ from those estimates. The accompanying financial statements have been prepared on a going-concern basis, which contemplates the realization of assets and the satisfaction of liabilities in the normal course of business. The Company has incurred net losses from operations since its inception and has an accumulated deficit of $355,270,000 at December 31, 2016. Management expects operating losses to continue through the foreseeable future. The Company's ability to transition to attaining profitable operations is dependent upon achieving a level of revenues adequate to support its cost structure through expanding its product offerings and consequently increasing its product revenues. Cash, cash equivalents, restricted cash, and investments at December 31, 2016 totaled $41,566,000. The Company has prepared cash flow forecasts which indicate, based on the Company’s current cash resources available, that the Company will have sufficient resources to fund its business for at least the next 12 months from the date of this filing. The accompanying consolidated financial statements have been prepared in accordance with U.S. GAAP and applicable regulations of the Securities and Exchange Commission, or the SEC. The consolidated financial statements include the accounts of the Company and its wholly owned subsidiaries. All intercompany accounts and transactions have been eliminated in consolidation. Restricted cash represents amounts designated for uses other than current operations and includes $758,000 at December 31, 2016 held as security for the Company’s letter of credit with Banc of California. Level 2 — Inputs, other than Level 1, that are observable, either directly or indirectly, such as quoted prices for similar assets or liabilities; quoted prices in markets that are not active; or other inputs that are observable or can be corroborated by observable market data for substantially the full term of the assets or liabilities. The carrying amounts of financial instruments such as accounts receivable, prepaid expenses and other current assets, accounts payable, and accrued liabilities approximate the related fair values due to the short-term maturities of these instruments. The Company has included $2,702,000 in the allowance for doubtful accounts as of December 31, 2016 and 2015 for past due amounts from its former customer, Natural Molecular Testing Corporation. Inventories are stated at the lower of cost (first-in, first-out) or net realizable value and include direct labor, materials, and manufacturing overhead. The Company periodically reviews inventory for evidence of slow-moving or obsolete parts, and writes inventory down to net realizable value, as needed. This write-down is based on management’s review of inventories on hand, compared to estimated future usage and sales, shelf-life assumptions, and assumptions about the likelihood of obsolescence. If actual market conditions are less favorable than those projected by the Company, additional inventory write-downs may be required. Inventory impairment charges establish a new cost basis for inventory and charges are not reversed subsequently to income, even if circumstances later suggest that increased carrying amounts are recoverable. Property and equipment includes diagnostic instruments used for sales demonstrations or placed with customers under several types of arrangements, including performance evaluation programs, or PEPs, and reagent rental agreements. PEPs are placed with customers for evaluation periods of up to three months and the Company retains title to the instruments under these arrangements. Maintenance and repair costs are expensed as incurred. The Company assesses the recoverability of long-lived assets, including intangible assets, by periodically evaluating the carrying value whenever events or changes in circumstances indicate that the carrying amount may not be recoverable. If impairment is indicated, the Company writes down the carrying value of the asset to its estimated fair value. This fair value is primarily determined based on estimated discounted cash flows. The Company did not recognize any impairment charges during the years ended December 31, 2016 and 2015. The Company offers customers the choice to either purchase a system outright or to receive a system free of charge in exchange for an annual minimum purchase commitment for diagnostic test cartridges. When a system is sold, the Company generally recognizes revenue upon shipment of the unit, however, if the end user already has the instrument being purchased installed at its location, revenue is recognized when the revenue recognition terms other than delivery have been satisfied. When a system is placed free of charge under a “reagent rental” agreement, the Company retains title to the equipment and it remains capitalized on the balance sheet under property and equipment. Under reagent rental agreements, the Company’s customers pay an additional system rental fee for each test cartridge purchased which varies based on the monthly volume of test cartridges purchased. The system rental fee and diagnostic test cartridges are recognized as contingent rental payments and are included in product revenue in the Company’s consolidated financial statements. The Company has not had significant product returns and is not contractually obligated to accept returns unless such returns are related to warranty provisions. The Company generally does not accept reagent product returns, mainly due to FDA regulations, and does not offer volume rebates or provide price protection. The Company enters into PEP agreements pursuant to which an instrument is installed on the premises of a pre-qualified customer for the purpose of allowing the customer to evaluate the instrument’s functionality over an extended trial period. The customer is generally required to purchase a minimum quantity of reagents and, at the end of the evaluation period, must purchase or return the instrument or sign a reagent rental agreement. Revenues related to royalties received from licenses are recognized evenly over the contractual period to which the license relates. In those cases where the Company bills shipping and handling costs to customers, the amounts billed are included in product revenue. In 2016 and 2015, Laboratory Corporation of America, Inc. represented 27% and 17%, respectively, of the Company's total revenue. In 2014, no single customer represented more than 10% of the Company's total revenue. The Company generally offers a one-year warranty for its instruments sold to customers and up to a sixty day warranty for reagents and provides for the estimated cost of the product warranty at the time the system sale is recognized. Factors that affect the Company’s warranty reserves include the number of units sold, historical and anticipated rates of warranty repairs and the cost per repair. The Company periodically assesses the adequacy of the warranty reserve and adjusts the amount as necessary.